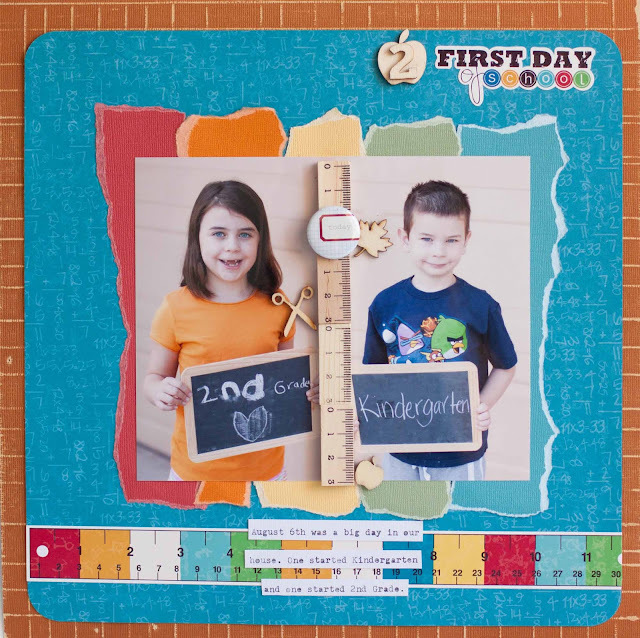 I had so much fun scoring and tearing the Core'dinations cardstock for this layout and combining it with the cute Echo Park patterned papers and stickers, fun Studio Calico Wood Veneer and adorable Maya Road rulers. OF course everything is glued down with Therm O Web adhesives.Sorry to post and run, but I will be back tomorrow! Oh how I adore those ripped strips on this one and your combo of colours is justr fabulous!!!! This is absolutely fabulous! The colours are just wonderful!! Such a fun and bright page! awesome. love the ruler and wood pieces. the torn paper is a great mat for the photos.